February saw the arrival of our 500th volunteer at Taricaya and that made the month special to those of us who have been involved in the project from its infancy. As the Taricaya family continues to expand, I am still constantly amazed by the dedication and commitment of volunteers at the center as they create their own part of Taricaya’s history. This month was no different to any other with more than enough work to keep us all busy and plenty more left to be done! The seasonal rains finally arrived with vengeance this month and the depressions around the reserve began to fill with water. This makes some areas of the reserve inaccessible for those unwilling to wade through a few swamps but fortunately volunteers and staff relish such adventure and “swamp” clothes were separated for the times when a soaking became inevitable. One such occasion was the successful release of our ocelot (Leopardus pardalis) together with a radio collar. Whilst this particular cat is no threat to people, its presence around the lodge needed to be avoided for the safety of the other residents in the animal release program. A young paca or baby spider monkey would make a tasty snack for a hungry ocelot and so we hade to take her further into the reserve. With the collar duly attached volunteers took it in turns to carry her through the swamps and out to EMTO colpa where we released the margay (Leopardus wiedii) in 2005. This site is deep in our reserve but not close to any of the borders so a safe place for the ocelot to establish its territory. It will not compete with the margay as the ocelot is larger, primarily terrestrial and more active by day whereas the margay is nocturnal and prefers an arboreal lifestyle, as demonstrated by our sighting of it on the canopy walkway last year. With the ocelot successfully released we now have the task of monitoring its progress in the wild by means of radio-tracking. This will be exciting for us as we have never actively tracked released animals before and it will be great to get an insight into its natural history as it establishes itself back in the wild. There was also an accidental release in February as one of our blue and yellow macaws (Ara ararauna) made a bid for freedom one morning as the flock was being fed. The escapee flew through the door as it was being opened and has joined forces with the scarlet macaw (Ara macao) released last month as they both circle the lodge regularly. 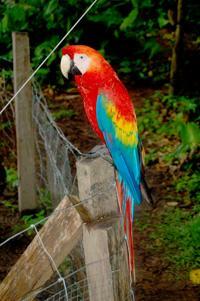 The blue and yellow macaw is much friendlier than its scarlet cousin and comes down to the hammocks requesting food. It would be easy to recapture the bird but I think it is better flying around the camp and strengthening its flight muscles because there is another blue and yellow macaw approaching its release date. The blue and yellow macaws will almost certainly join up when the other is finally strong enough and I hope to release the other scarlet macaw at the same time so that both species form pairs and start their new lives in the reserve. The rains have also meant a significant increase in the activity of the reptiles and amphibians around the reserve. The frogs and toads use the temporary water for breeding sites and their mating calls and displays inevitably attract predators such as snakes. The species list continues to grow as we encounter more wonderfully bizarre individuals. 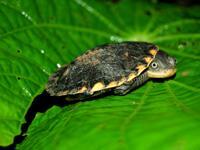 Notable captures/sightings in February include a new species of turtle (Chelonia), a rainbow boa, tree frogs (Hyla sp.) and a fantastic dwarf caiman (Paleosuchus trigonatus). 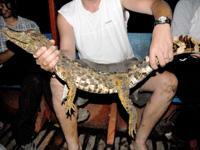 The dwarf caiman capture came during a caiman hunt out on the river one night after dinner. One of the talks I give at the center is on caiman and after the lecture I take volunteers out on the river to catch a caiman and illustrate the points I have previously outlined before releasing it back into the river. It is customary to catch either a black or a spectacled caiman but this time I was amazed to haul in a 1.1 metre dwarf caiman. Not only are these small crocodilians rare but the one I caught was close in length to the largest individual ever recorded. 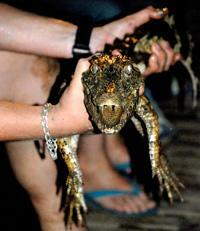 Dwarf caiman are rarely recorded over 1.2m so ours was a relative giant for the species. Their diminutive size means that they cannot compete with the larger caiman species and so dwarf caiman are reclusive and often nomadic and, as a defence against attack, their skins are much tougher with armoured scutes (plates) all over the body. This capture was unbelievable and fuels speculation about what other amazing creatures are out in our reserve awaiting discovery. The topic of the fish project had become somewhat of a joke at Taricaya as Fondepes, the Peruvian organisation responsible for breeding the young fish, kept postponing the delivery date for the fish we had ordered. Week after week Fernando and I would chase them up with no success and it was looking as though the project would have to be put on hold until next year as water levels started to drop in the creek. It got to the stage where volunteers were laying sweep stakes on whether the fish would arrive at all and if so when!! Then amazingly when I had all but given up hope the babies arrived in their oxygen-enriched bags ready for release into our floating nursery. After acclimatising the young roe to the cooler temperature of the creek by floating them in their bags we then transferred them to the nursery. Now we must monitor growth rates and costs of food to conclude whether the project would be economically viable for the locals as yet another alternative source of income. Should the project prove successful then we will help slow down the over-fishing of the rivers that currently takes place and also provide the locals with a means of making money that does not involve illegal extraction from the surrounding forest. Elsewhere at the pilot farm the flowers are continuing to flourish and we had good harvest last month from Percy’s farm also. The coffee beans are ripe and ready for harvest and the guinea pigs are continuing to reproduce as our base population becomes ever larger. The donkeys are doing well and the young Ronaldinho (named for its ability to kick in any direction!) is growing quickly into a strong juvenile. March will see us out on the trails clearing and remarking after the heavy storms of the wet season. The new mammal enclosure will be finished and work will continue on the existing projects. New accommodation in the form of more bungalows is also planned for March so Taricaya is continuing to expand and the hard work of everyone involved with the project continues to bear fruit as we continue to pioneer conservation work in Peruvian Amazon. To read the full version of Stuart’s report, please click here.